I’m a journalist and wine specialist who loves the broad landscape of Swiss wine, from its wines and vineyards to its extraordinary geography and rich cultural history. When I started to learn about Swiss wines some 35 years ago, however, they were impressive only erratically and I realized only gradually these were the early days of a significant shift. Today Switzerland is to wine what Scandinavia once was to interior design. It is a showcase for precision, discretion, and a vision that calls for products tied closely to their place of origin. These are clean and contemporary wines; you could almost argue that form follows function, the modernist credo. There is respect for the land and its history, for traditional handling of materials, but here function means understanding what the educated wine palate of a Swiss wine-lover desires. In the face of larger producers and energy-hog production methods, Swiss wineries have retained older skills while adding new ones. The artisans who produce Swiss wines are working in a laboratory for a better world, sensorially speaking. It has not happened by accident; in short, Swiss wines are, by design, modern and in the best sense crafted. They are made honestly by humans who create them with respect for the people who will drink them, and with quality as their signature. If you think most Swiss wine is white, try again! Pinot Noir is the most widely planted grape, followed by Chasselas, white. Here, a glass of La Colombe Noire by Raymond Paccot in Féchy, Vaud, a fine example of what Swiss precision and quality looks like in winemaking. 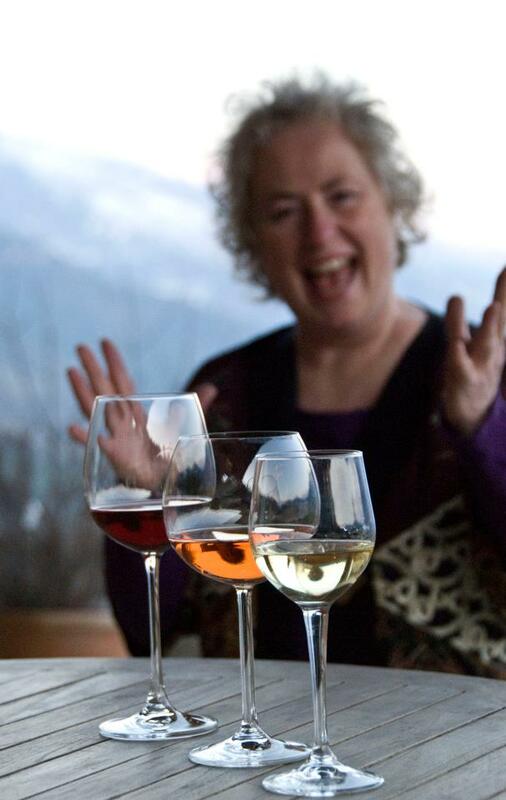 Join me for this very fun exploration of Switzerland through its wines! Happily, there are occasional forays into other wine worlds, because of my love for travel mixed with wine. My own journey through the landscape of Swiss wines began in 1985. I moved to Switzerland where I wrote occasional magazine and newspaper articles on the country’s wine. It began in earnest in 2006, when I published “Among the Vines”. That early blog on the popular Swiss news web site Genevalunch.com was the first work published regularly in English about Swiss wines. Today, one of the hot topics in the wine world is wine tourism, and everyone agrees Switzerland is ripe for it. So are we, the wine-lovers. Note: Ellen’s Wine World includes my 520 “Among the Vines” wine articles that appeared on the news site, GenevaLunch.com (2006-2015). The Swiss wine learning curve was a popular feature. This tapestry showing the landscape of Swiss wine is produced by a world traveler & wine devotee of long standing. These two loves percolate through all of my writing and photography. The young journalist I once was dreamed of being a photojournalist and I never set my cameras down for long. Landscapes, people, food, wine, lakes, mountains, garden jewels – the world. You’ll find me hard at work on Flickr and Instagram. The wines are often sublime, the result of good terroir, artisanal work and Swiss precision. Geography, soil and weather are what make Switzerland a tourism hotspot, but this is also at the heart of the varied Swiss wine landscape. A wealth of delightful grape varieties, especially native ones, gives incomparable variety. Swiss vineyards are world pioneers in healthier and safer viticulture/grape growing. Well-trained and creative artisans are responsible for this patchwork of thousands of small wineries. Postcard villages are the backdrop: this is where Swiss wine comes to life, and this is where you need to go next. Join me!